Package all the jewels of Juneau into the perfect tour tailored to your ideal day in Juneau! From Whale Watching to the Mendenhall Glacier to the top of Mount Roberts, we have something for everyone! Join us for a spectacular Whale Watching Adventure in our cool custom made boats (24 or 49 passengers). We guide you on a 2 hour whale watching tour, spotting Humpback whales and other wildlife. A visit to the Mendenhall Glacier to spend some time hiking, watching fish spawn at Steep Creek or enjoy an outstanding view from the Visitor Center is the perfect compliment to the Whale Watching! When you’re ready to leave the glacier, take the shuttle bus to return to Juneau’s port – the schedule is flexible to allow a shorter or longer time at the glacier, depending on your ship schedule. The shuttle leaves every 30 minutes from the glacier. Experience two hours of guaranteed whale watching and other possible wildlife board our custom-made whale watching boats! Afterwards our coach transfers you to the beautiful Mendenhall Glacier National Park for some dazzling views of the Mendenhall Glacier. Once you're back in town, enjoy Juneau's Original King Crab Eatery at Tracy's Crab Shack. The combo meal includes a meaty King Crab leg, yummy crab cakes, and their oh-so-delicious bisque! Beer and wine are available for purchase. City, Glacier & Whales, OH MY! On this tour, you get it all! The city portion of the tour travels through historic downtown Juneau, Alaska's Capitol City. Your driver has stories to tell, sights to show, such as the Red Dog Saloon, our dome-less Capitol Building, the Governor's Mansion and Douglas Island. At the glacier, you can spend about an hour to explore Steep Creek, the Visitor Center to view the spectacular glacier at an elevated view or other trails. We'll take you to the boat harbor for a 2 hour on-the-water whale watching with our informative Naturalists. All transfers between the city, the glacier and the boat harbor are included. Meet our largest local residents - the humpback whales! Once aboard your coach, your driver guide narrates as you're transferred to the harbor to board our custom-made whale watching boat. Experience two hours of guaranteed whale spotting and other possible wildlife. Once you're back in town, enjoy Juneau's Original Tracy's King Crab. The combo meal includes a meaty King Crab leg, yummy crab cakes, and their oh-so-delicious bisque! Beer and wine are available for purchase. 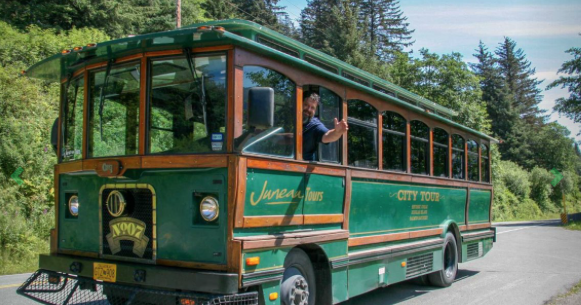 Experience a great overview of Juneau and Mendenhall Glacier on this half-day shore excursion while your ship is in port. Wind your way near Juneau’s historic downtown, Douglas Island and then to Mendenhall Glacier. You'll get some free time to explore the glacier’s trails on your own, then back to town to ride the Mt. Roberts aerial gondola in downtown Juneau. Dig into a satisfying seafood meal at a mountaintop restaurant while surrounded by stunning views. Nestled between stunning mountain vistas and winding waterways, the modern city of Juneau is reminiscent of the old west. The crowning point of the tour is Juneau's natural treasure, the Mendenhall Glacier. One of 38 glaciers flowing from the massive 1,500-square-mile Juneau Ice field. At this stop you can explore this glacial wonder from a variety of perspectives like Nugget Creek Falls and Photo Point Trail, which winds along Mendenhall Lake to an unobstructed view of the glacier's face. There you can also visit the Mendenhall Glacier Visitor Center for an elevated view of the glacier as well as interactive geological exhibits explaining glacier formation. BOOK ANY TIME, LEAVE ANY TIME, AND COME BACK ANY TIME. The shuttle is open ended - On Mondays - the Shuttle starts at Noon; Tuesday thru Sunday the shuttle starts at 9:00 AM. Last Shuttle usually leaves the Mendenhall Glacier Park at 6pm or 7pm. Your driver will know on the day of your arrival.